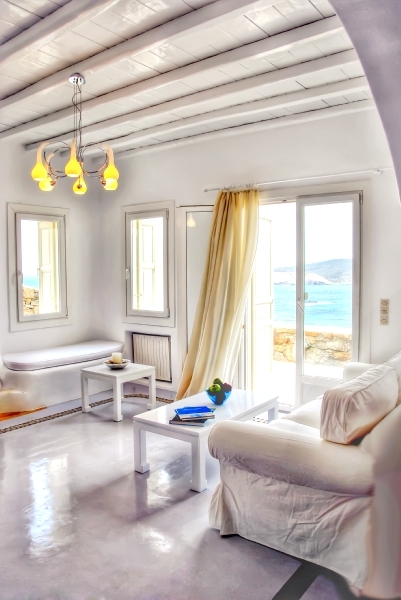 In a wonderful setting overlooking the sea and just 500 metres walk from Agios Sostis beach this beautiful villa has elegant moulded white walls which are so distinctive of the architecture on the Cyclades island of Mykonos. With a big private swimming pool, it is ideal for two families sharing or a group of friends. 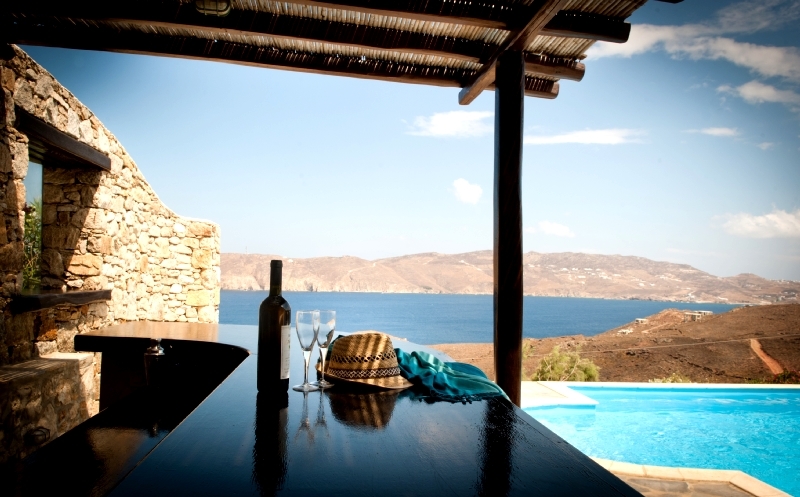 Villa accommodation covering 330 m² on three floors for 10 people, 5 bedrooms, 4 bathrooms. Air conditioning, satellite television, wifi. The ground floor has an attractive living and dining room and open plan fully equipped kitchen (with dishwasher, oven, microwave, coffee maker, refrigerator etc.). Master double bedroom with bathroom. The upper floor has a double bedroom and a twin bedroom (2 x 90 cm wide beds). Loft style bedroom with double bed. Two bathrooms. 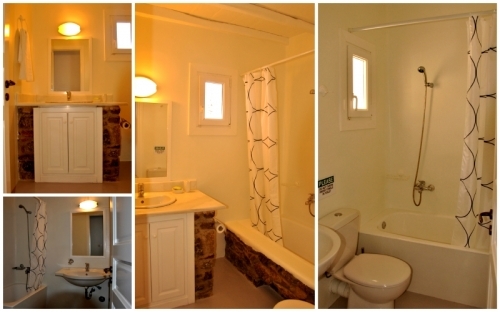 The lower floor has a kitchenette, stone build double bed and bathroom. The interior design of the villa is both elegant and comfortable with all the modern amenities you need for a successful stay. All the bedrooms have air conditioning and superb sea views. 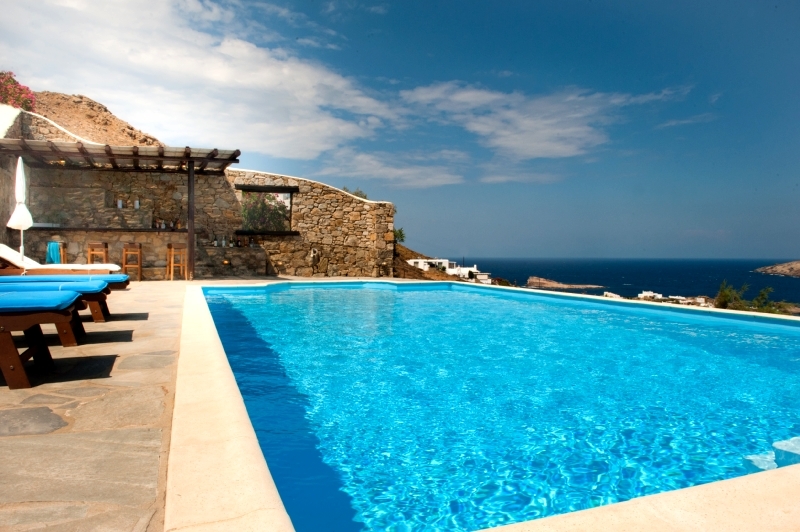 There is a lovely pool terrace equipped with sun loungers and you will enjoy the effect of the pool which appears to blends into the sea beyond. A shaded terrace by the barbecue is ideal for eating outdoors and the pool bar is a delightful place to enjoy a cool drink. East facing with stunning views this is a place for a holiday to remember. 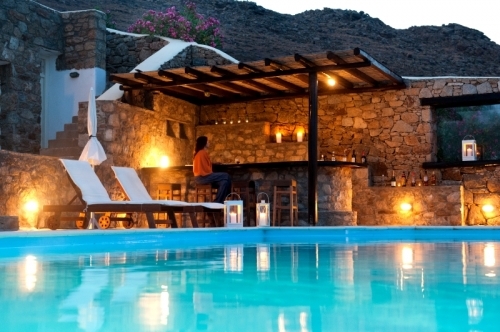 The turquoise sea and golden sand on one of the few natural and protected beaches in Greece are just part of the appeal here as in under fifteen minutes drive you can also discover the pleasures of Mykonos town. Mykonos port and town are both 8 km. Mykonos airport 8 km. Restaurant by the beach 500 m.